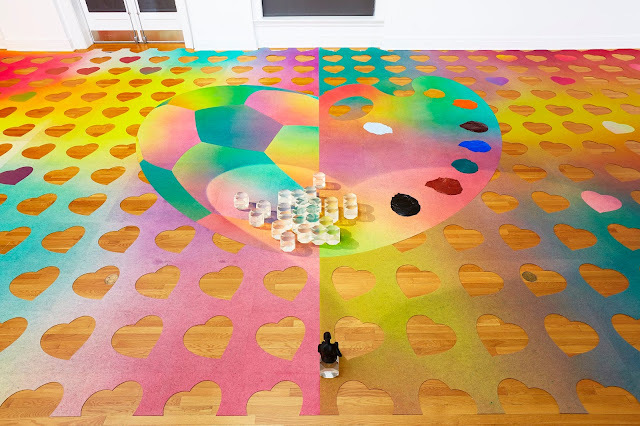 Visual artist Christopher K. Ho brings his site-specific carpet installation Dear John to the Peter Jay Sharp Building Feb 8—Feb 24, just in time for Valentine’s Day. We spoke with Ho about his approach to art-making, the inspiration behind this sprawling work, and his love of Taylor Swift. Tell us a little about yourself and your approach to art-making. I engage in project-based, researched-oriented art. This is a fancy way of saying that each work usually entails using different materials, and are guided by unique sets of questions. In Dear John, the material is primarily painted carpet, and the key question is: Can first love, and the powerful pangs and memories associated with it, be revisited when we become adults, and empower social transformation? How did you arrive at the materials you are using in this installation? Love is encompassing, can be disorienting, and often comes in emotional waves. I sought materials and a format that could evoke that experience. Dear John lies horizontally and is larger than the human body, in contrast to vertically hung paintings that we can instantaneously visually apprehend. The heart emoji are each rotated slightly differently so that, together, they undulate. And the colors, taken from a computer’s digital gradient, meld one into the next. Who are the two figures featured in the installation? The two figures—this love story’s nominal protagonists—are stand-ins for any viewer. 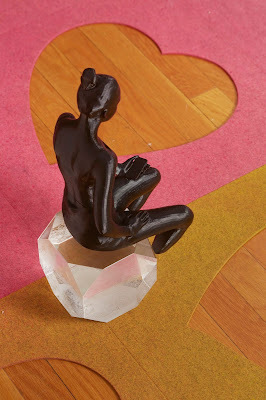 The seated female is 3D printed in relatively low resolution, and the male head, laser engraved into six glass cubes, is faceted. The model for his pose, half submerged in water, is the great pre-Raphaelite painter John Everett Millais’ Ophelia. Ophelia, a character from Shakespeare’s Hamlet, drowns, broken-hearted. Heartbreak often accompanies, and follows, love. The tragic dimension here is less dramatic and more contemporary. The female figure, preoccupied by her mobile device, misses the gaze of her would-be lover, who stares dreamily upward. Distracted and in their own respective worlds, they miss connecting with each other. Love comes in many different forms, varying greatly from person to person. What is your definition of first love? First love is pre-love; our brains are not developed enough to transform it into, and sustain it as, a mature relationship. It also only happens once, which means we never get the opportunity to experience it as adults. Because it forever eludes our cognitive capture, we miss it, literally and metaphorically. The very structure of first love is that of a missed encounter. What was the inspiration behind Dear John and the creation of this site-specific installation? I listened to Taylor Swift’s Fearless and Speak Now on continuous loop while making Dear John, with special focus on the songs “Dear John” (of course) and “Fifteen.” “When you’re fifteen,” Swift sings in the last, “and someone tells you they love you, you’re gonna believe them.” Belief—certain, unwavering, total—in art was what was faltering for me at the time: art’s ability to politically engage and to socially transform, to maintain relevance amidst technological transformations and to remain semi-autonomous from capitalism. Dear John was previously shown at your high school alma mater. 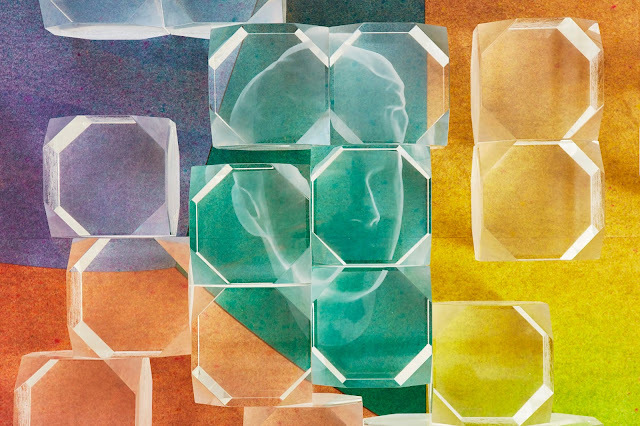 How has the installation changed and evolved for the new presentation at BAM? Reconfiguring Dear John for the Dorothy Levitt Lobby entailed adding a custom-made light fixture with two theatre lights, as well as placing pink light gels on BAM’s existing lights. (Both moves pay homage to the brilliant stagecraft happening all over BAM’s spaces.) 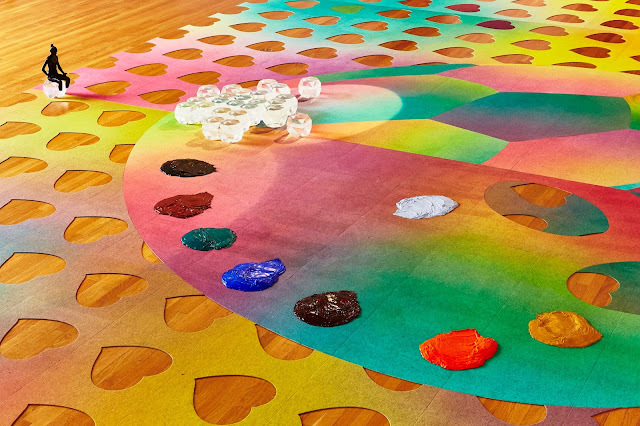 As the carpet gets dirty over the exhibition’s course, parts of it will be replaced with different colored carpet, so it will transform over time. I will leave this question open for viewers to complete. We all have our Johns: the person in high school you ogled but didn’t dare to speak to; the real reason you keep returning to the café down the street with bitter coffee; the person seated across from you on the C train with whom you exchanged smiles but not numbers; the Facebook friend of a friend whom you know, just know, is the one. 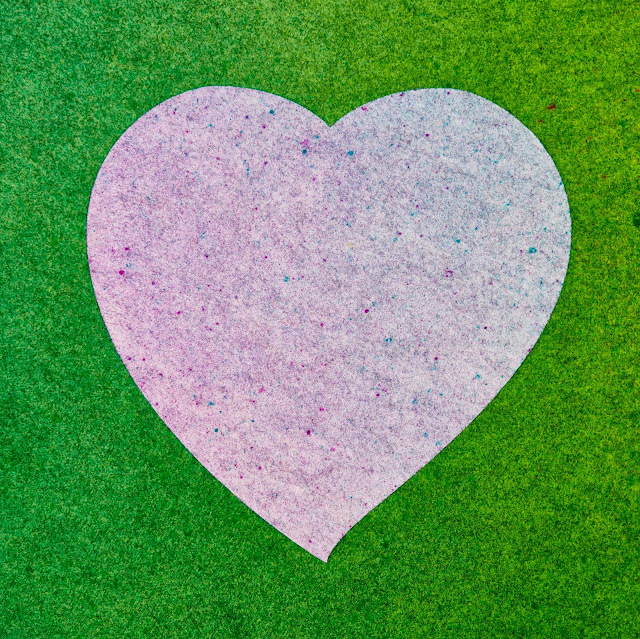 How do you feel about showing your work at BAM over Valentine’s Day? The timing could not be better. The only thing left, now, is for BAM to help me find the love of my life. Top photo: Dear John, Christopher K. Ho. Installation at Hotchkiss Tremaine Gallery.